In what could not only raise the curiosity of UFO (Unidentified Flying Objects) and alien enthusiasts but also general public, latest images of dwarf planet Ceres captured by NASA’s Dawn spacecraft has a pyramid-shaped peak mounting from a relatively flat landscape. The news came on the heels of reports that thepicture of the Mars captured by NASA’s Curiosity Rover on 7 May, 2015, has a structurethat looks like Egyptian pyramids, sparking off speculations that it is proof of alien’s existence and ancient civilisation. Scientists at NASA are still studying the features of the Ceres’ topography and are perplexed by some of the scenes captured by Dawn. “The surface of Ceres has revealed many interesting and unique features. For example, icy moons in the outer solar system have craters with central pits, but on Ceres central pits in large craters are much more common. 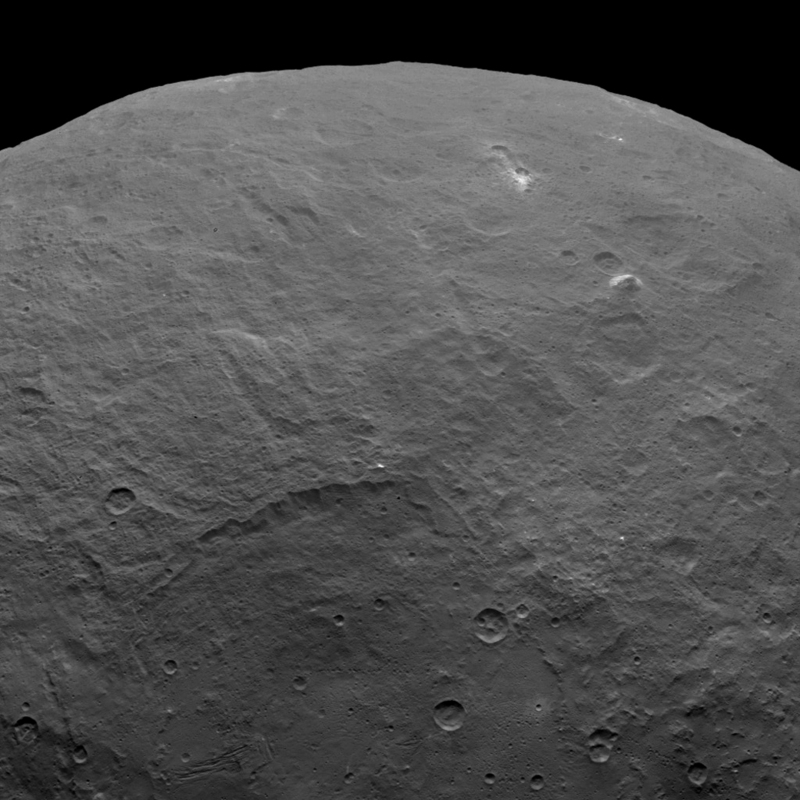 These and other features will allow us to understand the inner structure of Ceres that we cannot sense directly,” Carol Raymond, deputy principal investigator for the Dawn mission was quoted as saying by NASA website. NASA scientists had earlier expressed confusion over bright spots found on photos of Ceres and UFO enthusiasts rushed to the conclusion that they were alien cities. Interestingly, latestphotos of the dwarf planet have revealed a total of eight bright spots near the largest one. It could be reflection from elements like ice but scientists are not ruling out other possibilities. Latest images of the 598 miles diameter dwarf planet in the orbit of Neptune were sent by NASA’s Dawn from 2,700 miles (4,400 kilometers). The spacecraft will continue to takeimages of the planet till 30 June after which it will move to a new orbit and reach its 900 miles (1,450 kilometers) altitude destination in early August. It may be mentioned that Scott C. Waring, editor of UFO Sightings Daily, had earlier claimed to have spotted more bright structures on image of Ceres captured by NASA’a Dawn.